great oaks from little acorns grow: Colonel Mustard, Candlestick, Conservatory? Bridger, Hunting Knife, Special Education Classroom. No Thursday would be complete without a little drama. Background: Bridger was asked to help some Boy Scouts get their Disabilities Merit Badge by doing a presentation on Tues. Alan was also asked to help the older Scouts get their Law Merit Badge that same night. Alan has a set presentation he uses when asked to counsel this merit badge for which he conducts a moot court with the scouts prosecuting and defending a specific ambiguous case involving a hunting knife. 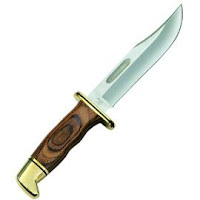 Alan was coming straight from work to the Scout meeting and asked me to grab his hunting knife for him to use. Since I am only carrying 50 bags of stuff anyway for Bridger's presentation and it is pouring rain, I consolidated and happen to throw the knife in Bridger's wheelchair bag. I didn't think to go through the bag this morning when I sent him to school. Luckily, the teachers did when they unpacked him this morning and found the weapon. Our county has mandatory suspension for students bringing weapons to school. The non-verbal child must have had to plead the 5th since he had no way of explaining his actions during questioning. I got a call from the principal about an "incident". I suspected child #1, possibly #3, but never sweet little #4. Apparently she had to plead our cause to the Assistant Superintendent to grant us a suspension pardon with the sternest of warnings to be a little more careful next time. I had to immediately come to the school and retrieve the knife. When Bridger got home I asked him if he had a knife in his backpack today, to which he confessed by blowing out his nose - his way of saying "yes". Guilty. Our medical file is already volumes thick -- I guess it is only fitting that our school file be equally as large.